The application period for 2018-19 closed on October 15, 2018. You can still login and check your application status or purchase a permit. 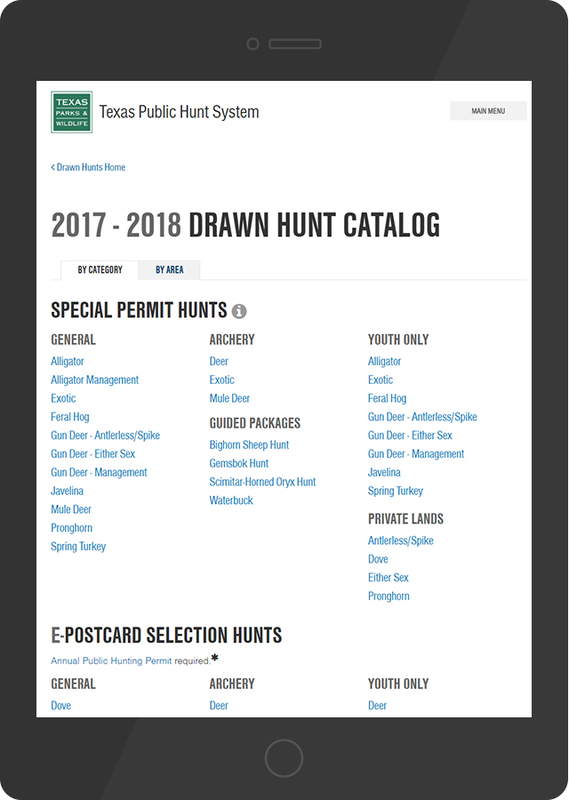 The 2019-20 drawn hunts catalog will be posted Summer, 2019. E-Postcard hunts and USFS Antlerless Deer permit applications will be available on August 15th. Additionally, adult applicants must possess an Annual Public Hunting Permit valid for the 2018-2019 season to submit e-Postcard and USFS Antlerless Deer permit applications. Youth applications will be limited to three per youth category. Find or create your account. Application deadlines on the 1st & 15th of each month. Email notification will be sent to drawn applicants. Your License ID number can be used as your identifier. Pay with credit card on secure website. Check status of application at any time. Permits purchased online and sent by email. Premium Private Lands Dove Hunts. Detailed information about the system. Throughout the transaction, sensitive personal information and credit card numbers are processed securely. The site is certified by Verisign. The Public Hunt Drawing System does not maintain credit card numbers on file after order processing. You can purchase applications or permits for yourself or additional individuals in a single transaction. Visa, MasterCard, and Discover are accepted. Payment for this transaction will be processed by Texas.gov, the official website of Texas. The price of this service includes funds paid to Texas.gov that support the ongoing operations and enhancements of Texas.gov, which is provided by a third party in partnership with the State. For example, if the transaction amount is $100, the total amount due will be $102.51. A confirmation for your order will be emailed to the billing email address that you specify. If you are applying for a hunt for a person other than yourself, you are confirming that you have the authority or consent of that person to apply for a hunt and to view that person's information. Under section Penal Code section 32.51, it is a state jail felony to use identifying information of another person without that person's consent.